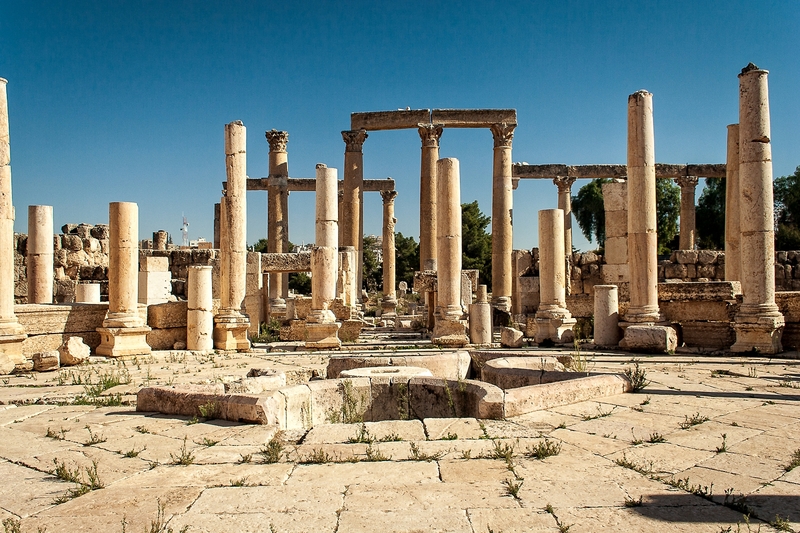 In norther Jordan lies the small town of Jerash, home to the best Roman ruins you’ve never heard of. When one talks about Roman ruins, it’s only natural to think of them being predominately in Italy, the center of the Roman Empire. It’s easy to overlook other amazing Roman ruins that exist throughout the former Roman empire, including those in Turkey, throughout northern Africa, and in the Middle East. 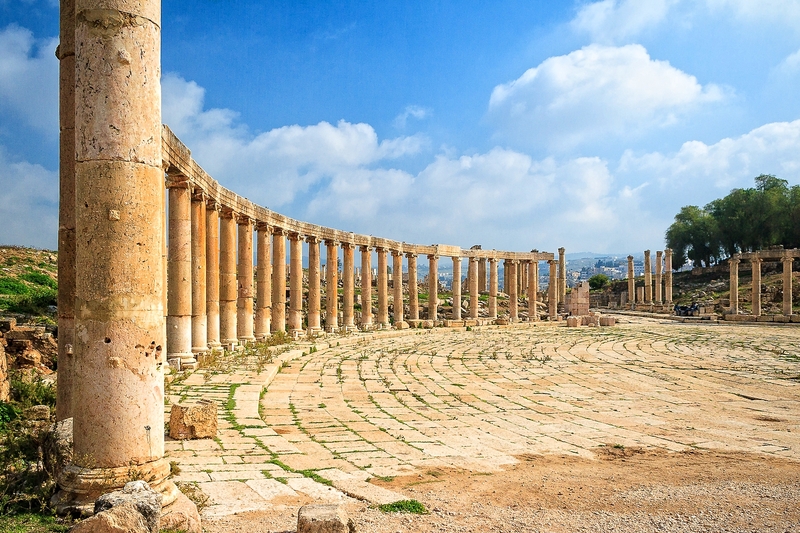 Since most people are completely unaware of Jerash before coming to Jordan, its common for travelers to exclude the city completely from their itinerary. To overlook this treasure on your visit to Jordan, however, would be a mistake. 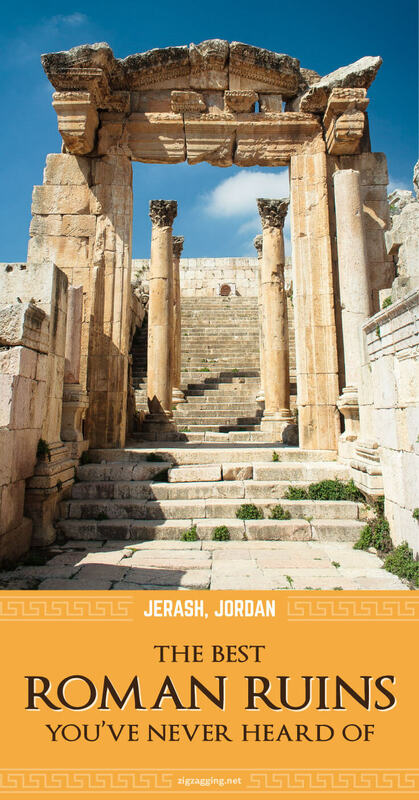 The modern day city of Jerash was once called Gerasa. It was established around the second century BC by Alexander the Great and was later annexed into the Province of Syria when Rome conquered the area in 63 BC. It was a member of the Decapolis, a group of ten cities in Jordan, Israel, and Syria. The city thrived in the second half of the first century AD, which resulted in excessive growth and prosperity. 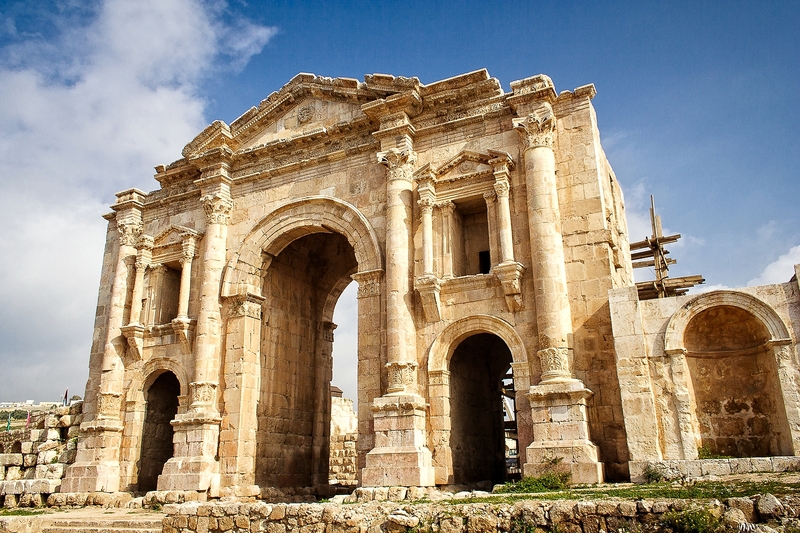 Jerash was a favorite of Emperor Hadrian, who visited the city in AD 129. The city became predominately Christian under the rule of the Byzantine empire. The prosperity of the city began to decline after the Persian invasion of 614. An earthquake in AD 749 destroyed much of the city. Some of the monuments in the city were cannibalized during the Crusader period, as their materials were hauled away to be used for fortress construction. Small settlements continued in the area throughout the Ayyubid, Mamluk, and Ottoman periods. A group of Circassians immigrated from Central Asia and settled in Jerash in 1878. Excavation and restoration of Jerash has been ongoing since the 1920s, with more aggressive reconstruction in the past 10 years. 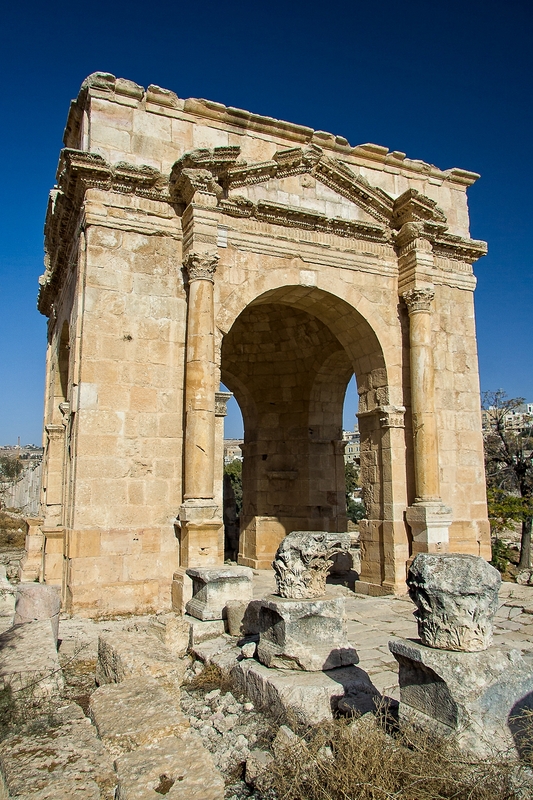 One of the first and most impressive monuments that you see when you approach Jerash is Hadrian’s Arch. This massive triumphal arch was built to commemorate Emperor Hadrian’s visit in AD 129. It was intended to become the main southern gate to the city, but the plans to expand the wall further south were never completed. Just past Hadrian’s Arch is the Hippodrome, also known as the Circus Gerasa. This arena is 804 ft (245 m) long and 170 ft (52 m) wide. It was designed to seat the 15,000 spectators who came to watch athletic competitions, chariot races, and other sporting events. Despite its apparent large size, the Hippodrome at Jerash is actually one of the smallest to exist in the Roman Empire. 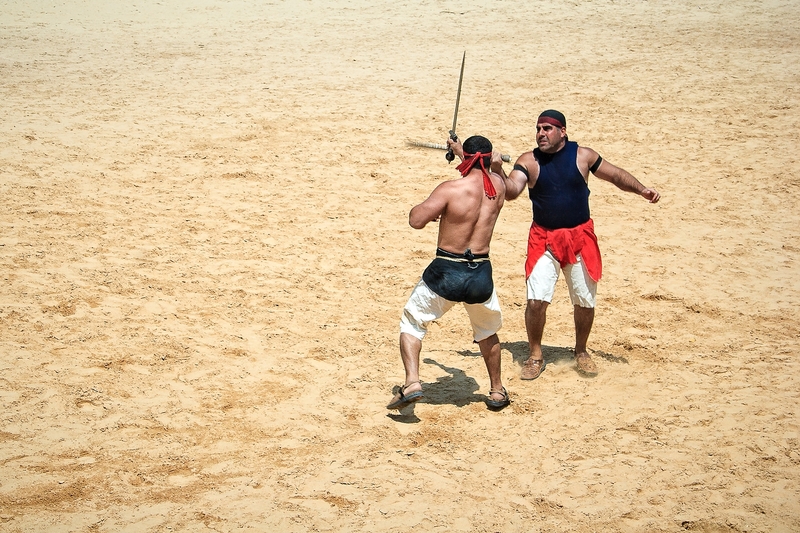 An interesting attraction that takes place inside the Hippodrome is the Roman Army and Chariot Experience, a show that reenacts Roman legion combat tactics, gladiator fights, and chariot races. In essence it’s a bunch of short Jordanian guys in one-size-fits-all armor, but they put on a good performance (complete with music from the Gladiator soundtrack). 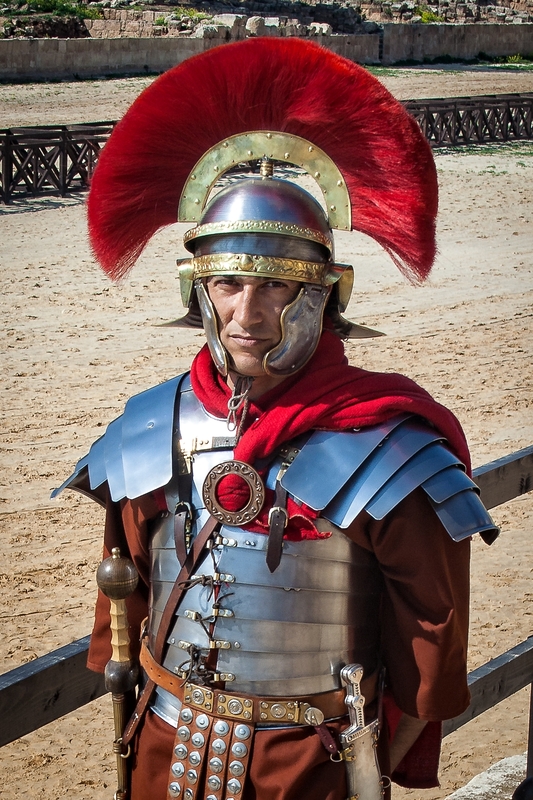 The Roman Army and Chariot Experience offers shows twice daily at 11 AM and 2 PM, except Tuesdays. There is one show on Friday at 10 AM. Tickets for the experience are sold at the entrance to the Hippodrome. Adult tickets are 12 JD (Jordanian Dinars) and children (ages 5-12) are 2 JD. You enter the Jerash city proper through the South Gate, a large portal that is flanked by partially standing city walls. The city walls were built in the 4th century, with the present walls being from the Byzantine era. 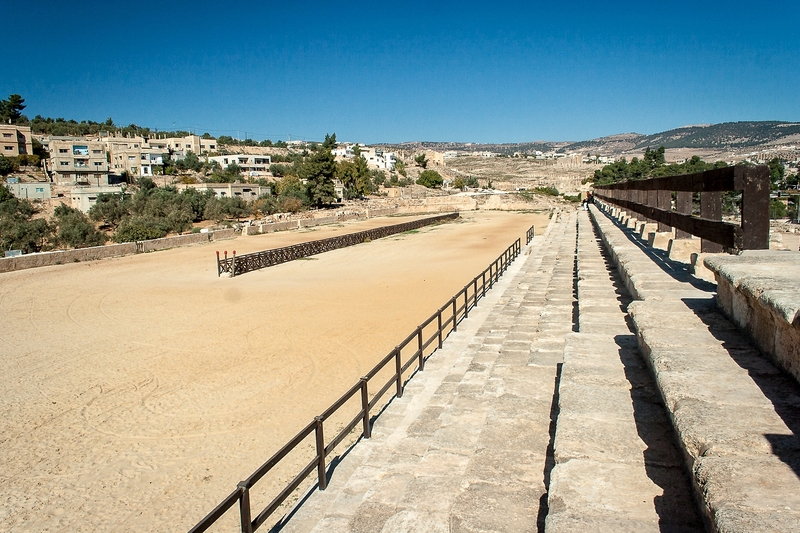 The walls have a total length of 11,338 ft (3,456 m) and enclose some of modern day Jerash. Rounding the corner from the South Gate, you’ll come upon the impressive Oval Plaza, aptly named because it pretty much forms an oval. As far as I know, it’s the only oval-shaped plaza in any ancient Roman city. It is the one of the most photographed locations in Jerash. The massive Temple of Zeus towers over the Oval Plaza. 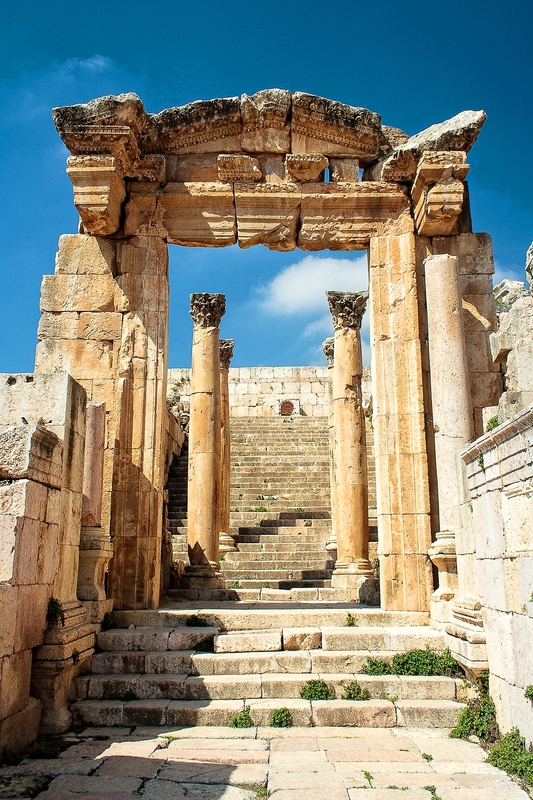 The temple can be accessed through an esplanade and up a flight of steps, offering great views of the ruined city and modern day Jerash beyond. The Oval Plaza opens to a long, paved street known as the Colonnaded Street or Cardo Maximus. As you explore the Cardo and its monuments, be sure to look down once in a while. You’ll notice the stone “manholes” that access the underground sewage system, as well as the ruts worn into the stone by chariot wheels. 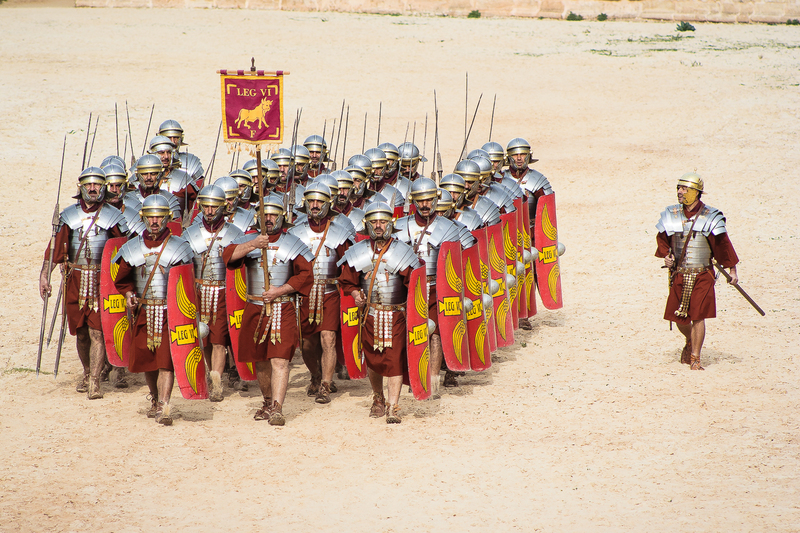 You’ll have the chance to explore the Macellum, or market place, as you stroll the Cardo Maximus. Just past the Macellum is the South Tetrapylon, an intersection of the Cardo marked by four large pedestals. Further up the Cardo on the left is the richly carved gateway of the Cathedral. In the 2nd century, the Roman Temple of Dionysus was built here, but a Byzantine church was erected on the site in the 4th century. Next to the Cathedral is a large, ornamental fountain dedicated to the Nymphs, known as the Nymphaeum. Similar fountains are found in ruins throughout the Roman Empire, although this one is especially grand. The lower niches were once faced with marble and water flowed from carved lions’ heads into several basins. The half-dome roof that once rested atop the Nymphaeum has since collapsed. Next to the Nymphaeum is the Propylaeum and Temple Esplanade, the processional and staircase that leads to the Temple of Artemis. Originally the Propylaeum was so massive it spanned across the river to an area which is now buried under modern-day Jerash. 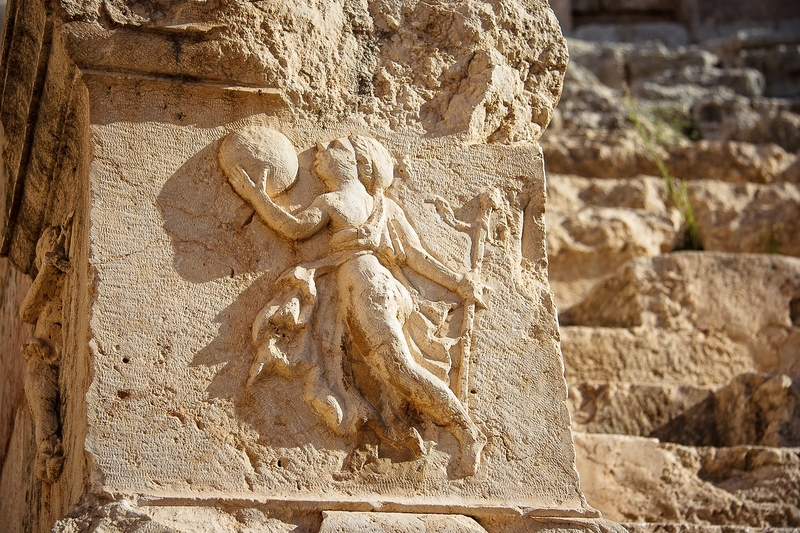 The largest temple complex in Jerash is one dedicated to Artemis, the patron goddess of ancient Gerasa and the daughter of Zeus. Though the temple is smaller than the Temple of Zeus, the terrace surrounding the temple is quite expansive. In front of the temple, 11 of the 12 original Corinthian columns stand vigil. The columns are the most impressive feature of the temple; the rest has been stripped bare over the years. The inner chamber of the temple is believed to have been once clad in marble, housing a shrine containing a statue of Artemis. The ruins at Jerash contain two theaters. The North Theater was used not only as a performance stage, but also as a city council meeting place. 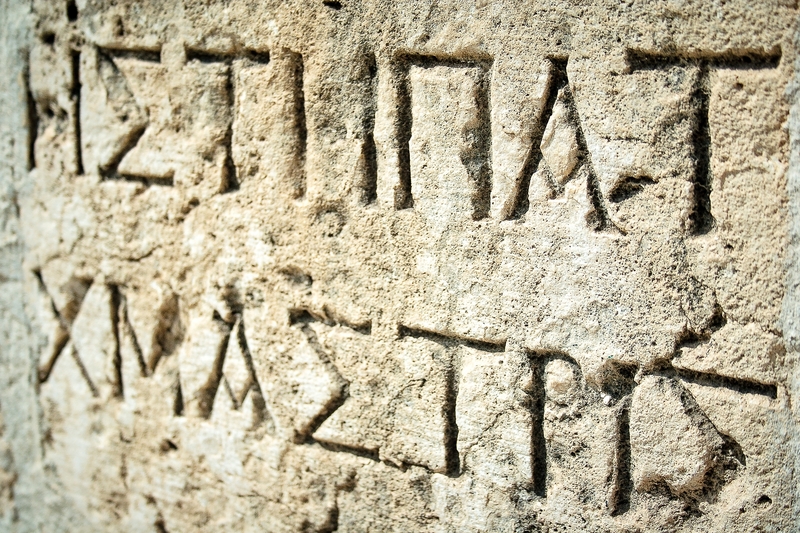 The names of the tribes represented in the council are inscribed in Greek at the end of the rows of the lower level of seats. The North Theater has a capacity of 1,600. Be sure to explore its vaulted passages and climb to the top of the upper structure. The South Theater is the larger of the two and seats over 3,000 spectators. 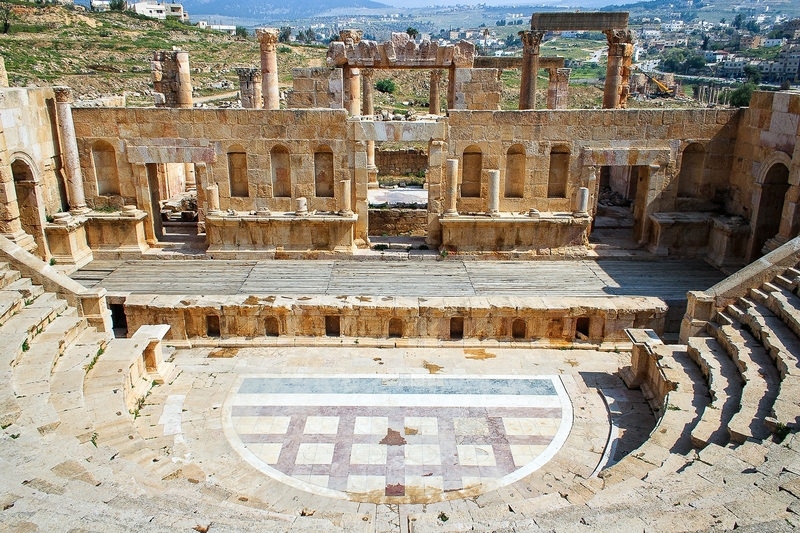 The theater is the primary venue for the very popular Jerash Festival of Culture and Arts which takes place each year at the end of July and the beginning of August. Expect Jerash to become crowded at this time, but if you find yourself in Jordan at the end of summer, it’s worth it to visit Jerash in the evenings during the festival. You’ll enjoy a showcase of singing, musical performances, dance, handicrafts, and art. 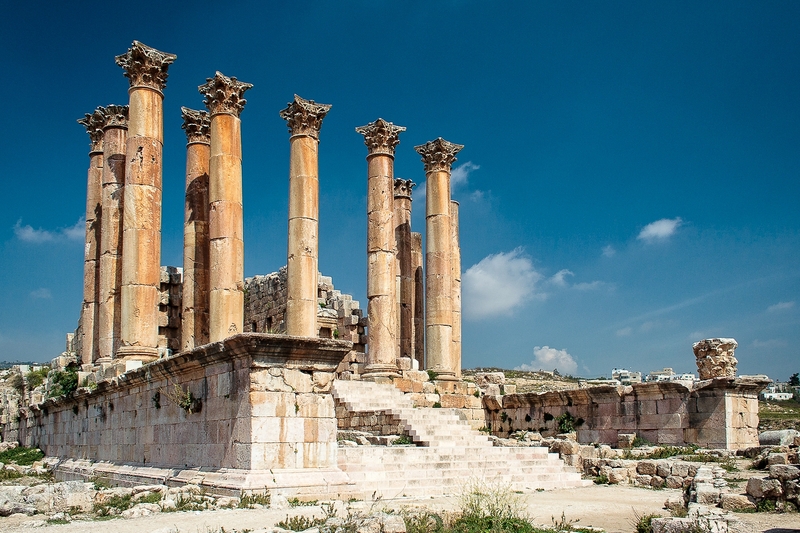 Jerash is acknowledged as one of the best-preserved province cities of the Roman Empire. Along with what has been highlighted here, there are an additional 20+ structures to see throughout the Jerash ruins. These include a number mosaic-filled churches, a couple Umayyad-period mosques, a bath house, a small archaeological museum, and lots and lots of columns. 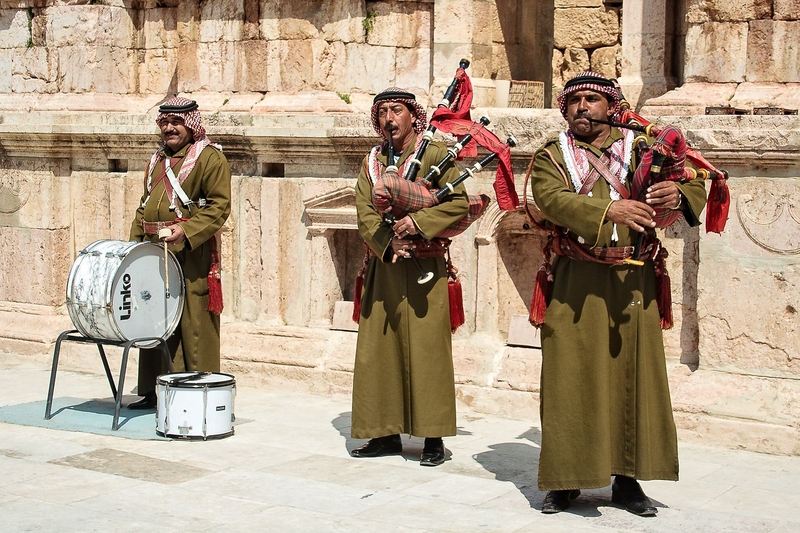 Now you have heard of it, so be sure to plan a visit on your next trip to Jordan. By Car: As long as you have a knack for directions, this is one of the most convenient method for getting to Jerash. Car rental in Jordan is pretty affordable. From the 8th Circle in Amman, take the north road towards Salt. Brown tourism signs mark the road to Jerash. By Taxi: Taxis are readily available in Amman. 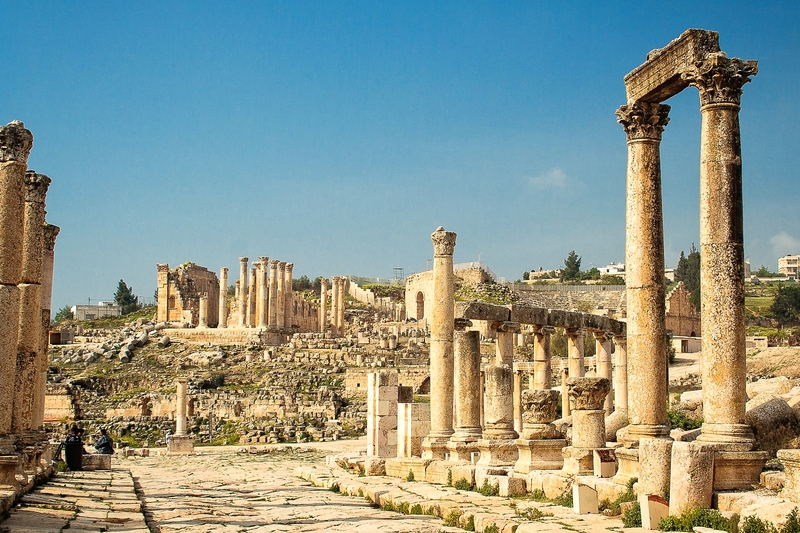 One-way fares to Jerash start around 10 JD. Expect to pay more for a round-trip fare, since the driver will have to wait for you as you explore the site. Negotiating the fares is common and even expected. By Bus: By far the cheapest but most complicated method of getting to Jerash. Buses leave from the Tarbabour bus station in Amman to Jerash regularly when they are full. Round trip costs around 3 JD. A word of caution: the bus system in Jordan can be confusing (poor routing signage, language barriers, etc), so only venture it if you feel confident. Hours of operation: 8 AM – 5 PM in the summer; 8 AM – 4 PM in the winter. Cost: 8 JD. Tickets can be purchased in the souk (shopping market) near the parking lot. Shopping: The souk area – an outdoor bazaar, of sorts – provides a nice offering of souvenirs and handicrafts. Be sure to bargain! Ajlun Castle: 10 miles north of Jerash is the town of Ajlun, which features a Crusader-era Islamic fortress. The castle is an interesting maze of passages and levels and offers beautiful views of northern Jordan.